I used to be one of the most avid believers in black seed oil, I still am to a limited degree. But in my view, black seed oil does not quite carry the same mystique it once held. Not that black seed oil is anything like the juicing fad, but it’s somewhat similar. Many of us including myself used to buy these expensive juicing machines to extract the “healing” nectar of fruits and vegetables, at least we thought we were, but in reality, we were leaving behind the most nutritious parts of the fruits and vegetables in the pulp, while extracting mainly water. Black seed oil is not quite water, it actually has incredible healing benefits. See my article “Black Seed oil the cure all“. There are at least a thousand articles on the health benefits of Black seed oil and its main active compound thymoquinone on PubMed, but there are less than 10 on the seeds, I believe that is by design. 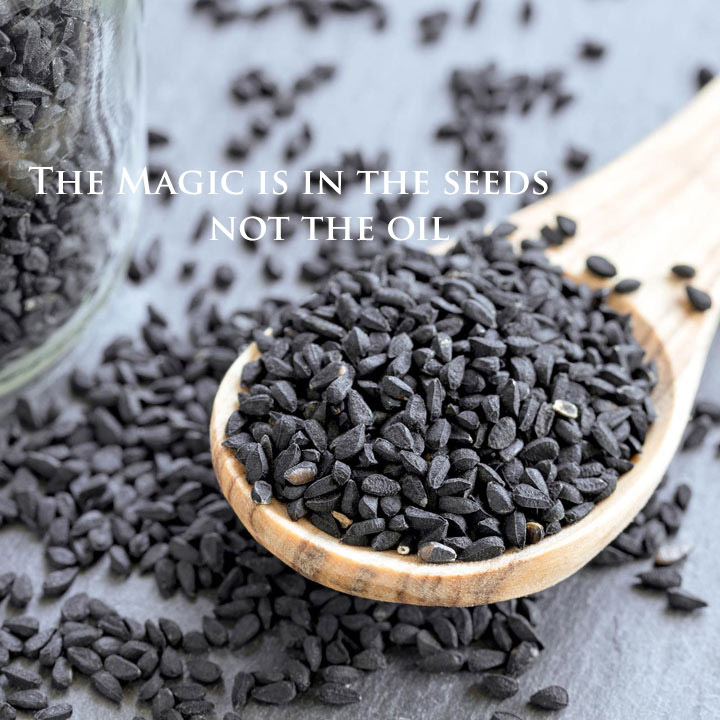 The true magic is in the seeds, not the extracted oil. Over the last 6 months or so I’ve had a change of perception, I’ve realized where the extracted oil is like “Batman”, the seeds are like “Superman”. I always used to recommend people use Black seed oil if they had cancer, even over organic lemon peels(they also kill cancer cells). See my article on “How to cure cancer naturally“. But all that changed when I discovered that the powdered Black seeds cure Hiv and the extracted oil doe’s not. See my article on “Reverse Hiv in 6 months with Black Seeds“. A woman who read my Hiv article had left a comment that she was Hiv+ for a decade and reversed her Hiv status in 6 weeks by taking the powdered black seeds. Now she didn’t find out about the black seeds reversing Hiv from my article, she found out from another source. According to her, she wanted to know if anyone else knew that powdered Black seeds reversed Hiv, so she searched the internet and found my article. Then the brother of a good friend of mine from Brazil developed metastatic testicular cancer. My friend was devastated, but I told her Black seeds destroys cancer and not to worry. I gave her 6 ounces of powdered black seeds to give him when she went to Brazil on vacation. I told her to tell him to take 2 teaspoons twice a day with water or juice. Five months later to the date, he was 100% cancer free. I believe when extracting the oil from the seeds, we are leaving behind it’s most powerful healing compounds. The oil along with the other parts of the seed work synergistically with each other to do the health miracles which have made it famous since the time of the pharaohs. You can purchase organic ground black seeds from me on my Etsy store, click here , or you can buy them directly from this site here. If you do not buy them from me, it’s imperative that you buy them organic, because when you apply pesticides to a plant it changes its chemical composition, which in turn changes its healing abilities. Necessary internet disclaimer: All information and resources found on Nothingsincurable.com are based on the opinions of the author unless otherwise noted. I am not a doctor nor do I have any medical training, all information is intended to motivate readers to make their own nutrition and health decisions after consulting with their health care provider. The author of this site encourages you to consult a doctor before making any health changes, especially any changes related to a specific diagnosis or condition.